Experience the taste of Café de Olla or Oaxaca Style Coffee. It is a flavourful & sweet traditional Mexican Style coffee that you can make at home and enjoy with friends. 1 small piece of orange peel. Add all the ingredients in a pot and boil for 5 minutes. Serve this delicious coffee in Mexican style cups and your Mexican coffee is ready to enjoy!! You can accompany it with cookies or sweet bread. 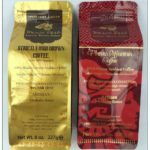 Mexico Real Coffee is a Specialty Coffee – Gourmet Mexican Coffee 100% Pure Arabica Altura Coffee (Cafe de Altura). Altura is the Finest Grade of Mexican Coffee Grown, Altura means “High-Grown”. Mexico Real Coffee was the only Mexican Coffee that Won 2 Stars in the Superior Taste Award by the iTQi. Our Coffee Beans are Artisan Roasted in Small Batches. Mexico Real Cafe Coffee is environmentally friendly farmed and free of pesticides. It grows wild in shade on volcanic soils in the most exotic tropical rainforests next to the coast and nurtured by sea breezes.